It’s our belief that pancakes are a uniquely perfect breakfast food. Make ‘em small, make ‘em large. Add fruit. Add chocolate. Douse it in whipped cream. A perfect stack of pancakes might very well be the best way to start the day. 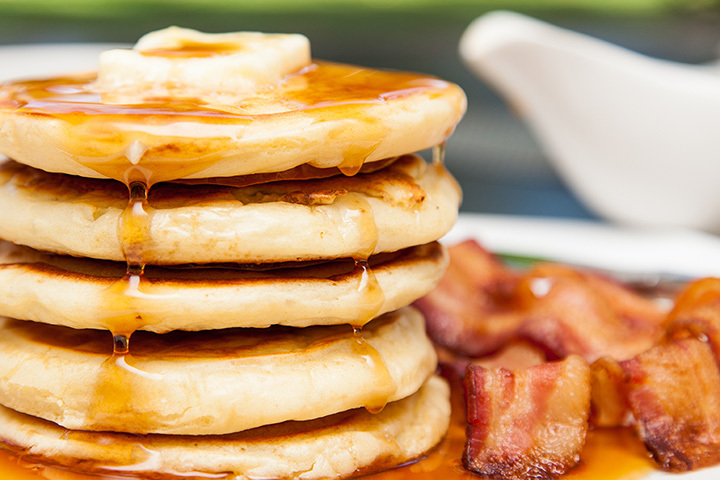 If you, like us, believe in the power of pancakes, then you should do yourself a favor and try the offerings at the following 10 best places for pancakes in Kansas. You can thank us after breakfast. The Hanover Pancake House in Topeka, Kansas has been a pancake staple since 1969. That’s a staggering 40 years of experience making delicious breakfast. How could you possibly go wrong? Choose from whole wheat, chocolate chip, pecan, blueberry, hot spiced, buttermilk, cheese, and more. Eggtc. has been in business for over a decade, racking up accolades such as “Best Breakfast and Brunch” from Kansas City Magazine and more. According to their website, they “dish up a myriad of savory and satisfying culinary delights in a style as down home or as upscale as your appetite.” The menu is extensive, the coffee fresh, and the food perfect, especially the pancakes. Tavern, an upscale-casual restaurant at Mission Farms in Leawood, Kansas serves classic American dishes for any lunch, dinner, and brunch. Served on weekends, brunch includes options like breakfast nachos, steak and eggs, and short rib hash in addition to their buttermilk pancakes, served with a side of mixed berry compote. RM 39 in Leawood, Kansas has been a Kansas City staple since 2004. However, we’re focused on the Leawood location, as the Kansas City one is technically in the Missouri (that doesn’t mean you shouldn’t go, though!). Their website describes their breakfast and lunch as casual affairs in their beautiful dining room with “simple yet elegant food such as steak and eggs benedict.” But their blueberry and yogurt pancakes are what keep us coming back for more. Old 56 in Ottawa, Kansas offers sit-in service as well as carryout and delivery. Their menu consists of egg fare served with hash browns and toast, omelets, healthy options, and much more. They serve affordable breakfast options all day long, including their “short order” of extra-large pancakes for a cool seven bucks. Urban Table elevates breakfast food in Prairie Village, Kansas. They’ve got a wonderful brunch menu with items like pancakes and fried chicken, waffle sliders, and freshly baked cinnamon buns. Consider their breakfast catering options for your next morning event, too. The Chef Breakfast Café has been featured on the Food Network and one of the best local restaurants from Local Eats. The Chef traces its roots all the way back to 1943, in which “Manhattanites packed into the undersized café with the famous horseshoe counter.” The menu is large, but you can’t go wrong: It’s all great, but pancake lovers simply must try the pancakes bananas foster. The 9th Street Diner is a Salina breakfast staple. Their self-described “easy-going home-style breakfast and lunch for the whole family” makes eating there a delight. Come in for a hot meal, a tasty breakfast, and a welcoming atmosphere. Choose from single, double, or triple pancake stacks with chocolate chips, blueberries, or bacon. Ask about gluten free options. One recent reviewer put it perfectly: Pheasant Run Pancake House has “Great Food. Great Service.” Everything is homemade with breakfast served all day long. The main attraction is in the name: They’ll become your favorite pancake house after one bite. Ronnie’s Restaurant makes their dishes from scratch every single time. Choose from scramblers, classic American breakfasts, omelets, benedicts, breakfast sandwiches and more. Check out their website for photos of their stellar dishes but beware: You’ll need a towel to clean up all the mouthwatering. According to their menu, “all of the pancakes we serve are made from scratch in our kitchen.” Add fruit or eat them plain.